A Spooky, Jack-O-Lantern Mist Maker. Perfect for a porch display, window decoration, or for adding some spooky ambiance inside your home. This rather large pumpkin is quite unique, and guaranteed to be the envy of friends and family members. Just fill it with water, turn on the mister, and then listen for the oooohs and aaaahhhhs. The interior of the Jack-O-Lantern will light up to define the facial shapes and make it noticeable from far away. This effect alone is quite amazing, but there's more. As the interior is illuminated, mist will begin to pour out of the mouth, and gently float out of the nose and eyes. It will look like thick billowy trail of fog or smoke, but it's nothing more that water vapor. The combination of effects is truly amazing and sure to be a real crowd pleaser. When used inside your home, a mist fountain like this can be beneficial to your health. They add humidity to the air along with negative ions. The humidity can be great in dryer climates, or in winter when furnaces tend to dry out the air in our homes. The negative ions generated will help to clean the air in your home of contaminants. Dust, dirt, and pollen are neutralized by a fountain like this, so it can be a relief to allergy sufferers or anyone else that enjoys breathing cleaner air. Add just a few drops of aromatherapy oil to the water and the Pumpkin Mist can act like an essential oil diffuser. The Pumpkin Mist is the ultimate Halloween decoration. A solid blue glow gives it a pretty scary look, and the large sizing makes it look great next to other freshly carved versions, or as a stand alone decoration. Keep it filled with water, and thick fog will continue to pour out of the mister for hours on end. The spooky cloud will completely fill the inside, and then begin to float out. Because the unit has integrated lights, it will make the fog more visible as it appears to glow and change colors. Captivate trick-or-treaters walking up to your door, or add a unique touch to your haunted house. 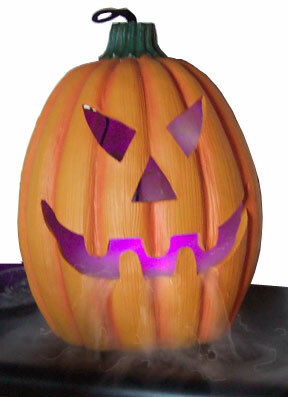 This incredible looking pumpkin works by utilizing electrical oscillation technology. A ceramic disc in the misting unit vibrates under high frequency to generate negative ions and a natural fog on the top of the water. There are no chemicals or dry ice involved, and simple tap water alone is all you need to make it work. Set-up is easy too. Just fill it up, plug it in, and you are good to go. Order Yours Today! Uses Makes the perfect Halloween decoration, indoors or out. Also doubles as a humidifier, air purifier and fragrance diffuser. A spooky Halloween decoration, or the perfect gift for someone that loves pumpkins. This mister creates a great focal point and a truly unique decoration.Order Yours Today! Had no idea how much water vapor this thing put out. My wife was not amused. Place it in a deep dish with artificial flowers around it to capture the water. I loved it . I have this item and let me tell you, people want this soooo bad for their parties. I lost the wall plug and have been looking for this for the last two years. Now i can use ths again. This is worth every penny you pay for this. I have this item and the wall plug-in was tossed out when we moved by mistake. Can I purche's only the wall unit only? I have the mister part and Pumpkin and only need this part. Please email ASAP so I can find out if I can use this for our party. Thank you. We may have a compatible AC adapter available. Give us a quick call, and someone can check inventory for you and complete your order over the phone if one is available. I do not have the directions. Do I put the lights inside the water? The parts are one pumpkin one round metal puck with lights on it and a plastic stand with three legs and a plastic bowl but can not sit because it has a short plastic needle sticking out in the middle. I bought it at a yard sale, it is from kirklands and is called Jack O'Lantern mister. Please help my son and mother really want this to work! The lights and mister are meant to go in the water. The plastic parts are probably intended for use as a splash guard, but you may be missing a portion of it. If you fill with water and let it run, you may notice that the water stays inside, so the piece is not needed. 100% Pure. Use in aroma diffusers, oil warmers, or right on your skin. Perfect for respiratory ailments, muscle aches and more. 100% Pure. A popular, earthy aroma. Use with diffusers, oil warmers, ultrasonic misters and more. Sweet and slightly floral. An enjoyable aroma that's rosy and uplifting. A decorative lamp and fragrance diffuser in one. Deodorize your home the natural way.